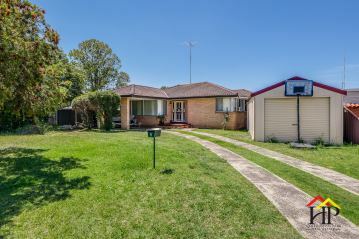 Perfectly positioned in a quiet cul de sac, is where you will find this terrific property, just a short stroll from Narellan Town Centre. The much loved 3 bedroom home offers built ins to all rooms, large formal lounge and dining and you will definitely be impressed by the stylish kitchen and bathroom renovations, making this home ready to move right in. For those that enjoy having room to move, the huge backyard is sure to be a hit, especially with the added benefit of side access that leads to a garage/shed to store those treasures that you want hidden away, complimented by a single garage and carport at the front of the property. This is a rare find, so call 4647 3999 to arrange an inspection now, to avoid the disappointment of missing out. - 3 Bedrooms - Built ins - Renovated Kitchen and Bathroom - Huge yard with side access - Parking for 3 Cars - Short Stroll to Town Centre - Large 784m2 block ALL PROPERTIES ARE AVAILABLE TO INSPECT 7 DAYS A WEEK AND AS ADVERTISED Harrington Park Real Estate have in preparing this information used our best endeavours to ensure that the information contained herein is true and accurate. Prospective purchasers should make their own enquiries to verify the information contained herein.